FRIDAY, March 1, 2019 (HealthDay News) -- Fast food fans today are ordering off menus that have grown more apt to make them fat. 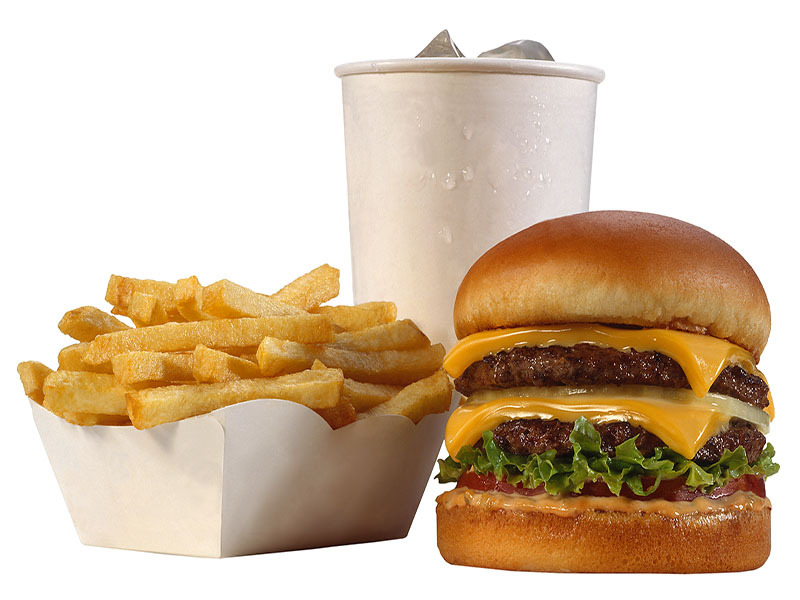 As a result, the amount of calories and excess sodium has also increased among fast food offerings, said lead author Megan McCrory, a research associate professor with the Boston University College of Health and Rehabilitation Sciences. Average portion size nearly quadrupled for fast food entrees, and more than quadrupled for desserts between 1986 and 2016, McCrory and her team discovered. Calories and sodium content in entrees, sides and desserts also increased significantly. Desserts packed on an extra 62 calories per decade, while entrees increased by 30 calories per decade, researchers reported. Meanwhile, sodium increased by about 4.6 percent of recommended daily value for entrees each decade, and 3.9 percent of daily value for sides. "The portion size increase is largely responsible for the increase in calories and sodium," McCrory said. Responding to the new study, the National Restaurant Association said it has championed menu labeling "to give customers the information they need to make healthier choices for their families. "In 2008, we launched the Kids LiveWell program to promote consumption of fruit and vegetables, lean protein, whole grains and low-fat dairy, while limiting unhealthy fats, sugars and sodium," the association said in a statement. "The association continues to educate members about the benefits of offering healthier menu items and participating in portion balance discussions with industry leaders." But the increases discovered in this research also reflect the "provocative" changes that have occurred in fast food within recent years, said Michelle Milgrim. She's a registered dietitian and manager of employee wellness at Northwell Health in New Hyde Park, N.Y., and was not part of the study. These changes include sandwiches that replace buns with fried chicken breasts, pizza crust filled with cheese, and bacon added to many menu items, Milgrim said. "We're seeing new items we've never seen before," Milgrim said. "The American public is probably not necessarily picking up on the nuanced increases in portion size year over year, decade over decade, that these new items entail." Fast food restaurants are more popular than ever, with nearly 2 out of 5 adults eating fast food on any given day, researchers said in background notes. The average amount of total daily calories represented by fast food has more than doubled, rising from 4 percent of total caloric intake in 1977-1978 to 11 percent in 2007-2010. For this study, the researchers reviewed menu items offered at 10 popular fast food restaurants in 1986, 1991 and 2016. The restaurants were Arby's, Burger King, Carl's Jr., Dairy Queen, Hardee's, Jack in the Box, KFC, Long John Silver's, McDonald's and Wendy's. Menus at these restaurants offer more selection than ever. The total number of entrees, desserts and sides increased by 226 percent, or about 23 items per year, researchers found. But portion sizes also steadily increased over the years, a trend that reflects overall American eating patterns, McCrory said. "I think we see an increase in portion size pretty much in the entire food supply," McCrory said. "In some ways, the fast food restaurants are probably just keeping up with expectations of the size of the food people expect to be served. The same kind of things are happening in other restaurants that aren't fast food." Milgrim said she's most concerned with the steady increase in fast food's salt content. "These foods are just sodium-laden," Milgrim said. "With obesity and hypertension as main causes of mortality among the American public, it's so important for us to consider sodium." It's not all bad news. Calcium and iron levels also increased in fast food over the years, meaning that folks are getting more of these important nutrients, McCrory said. But given how calorie-rich fast food is, "there are better places to get calcium and iron," McCrory added. People who love fast food can take steps to cut back on calories, McCrory said. They can split their fries or dessert with a friend, or order a single burger instead of a double, for example. "They can still get the same taste, they would just be getting less calories," McCrory said. Even better, people can start considering fast food as a treat instead of a regular option. "I understand fast food is an economical way to get food that tastes good, and you know what you're getting when you go there," McCrory said. "But it might be good to eat fast food less often, make it more of a special occasion instead of something that's done regularly." The new study was published in the March issue of the Journal of the Academy of Nutrition and Dietetics.